What is PAX? 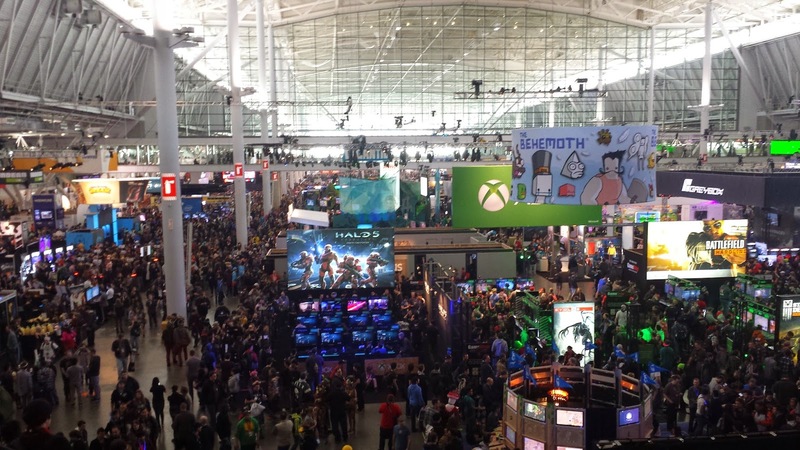 What is PAX East? Why, as a matter of fact, do I care? 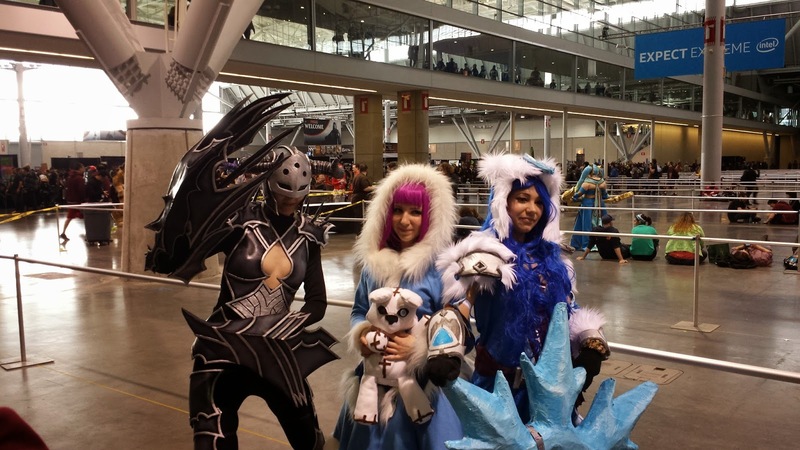 PAX is a gaming convention - actually, a series of them. PAX Prime, the original (Seattle); PAX East (Boston), PAX South (San Antonio, newest) and PAX Australia (guess where?) - Penny Arcade eXpo. Founded by the guys who created the Penny Arcade webcomic. It is a HUGE event, drawing tens of thousands of people to each convention. You doubt, perhaps? That was the scene late Sunday afternoon, the END of the eXpo. But WAIT! I hear you cry. You? GAMING? It was impressive, though. HUGE, well-planned displays, spreading across the floor of the BCEC (Boston Convention and Exhibition Center, just a few blocks away from the Children's Museum in South Boston). Let me back up a minute. The saga begins last year when my son first mentions, Hey, Dad, how about going with me to PAX East next year? Sure, sure, I say, having NO CLUE what I'm getting myself into. At least monthly he reminds me, until October. Then it becomes, Okay Dad, you need to keep track of when the passes go on sale, they sell out quickly. Sure, sure. Quickly. Right. (See, my experience has been with DragonCon, where the passes for the following year go on sale as the current Con is ending, and are available all year long, right up to the beginning of the NEXT Con.) But quickly is what he meant - it seemed that the three-day passes (the best bargain, Friday-Saturday-Sunday for $90) sold out for 2014 in TEN MINUTES. I think quickly and immediately purchase single-day passes for Saturday and Sunday, figuring that missing Friday, while unfortunate, is probably all for the best. I won't miss work or college (yes, back in school - but that's another post), he won't miss school. So now the waiting begins again. PAX, apparently, sends all of the passes out a couple weeks before the event. Lo and behold, late February and I get a stiff, thick envelope, and the passes are enclosed. Friday of the event, pick him up after school, bring him back to my home, feed him and get to bed early. Prompt start the next day! Yeah, prompt. Up before dawn, out of the house before sunup, but we get down to Boston about 10:30 (panels begin at 10, but there weren't any we wanted to go to). Find a parking spot that does NOT cost an arm and a leg a block away from the BCEC, and walk over...to get in a queue. We head down the block on the right side of the sidewalk, a stream of conventioners flowing down the LEFT side back TOWARD the BCEC. We end up walking to Melcher St, about 3/4 mile, I estimate, before reaching the end and turning around to walk back. We get in and - the building just swallows up the crowd. Oh, it's THERE, but it's not oppressive. Even down on the floor, it's not bad. 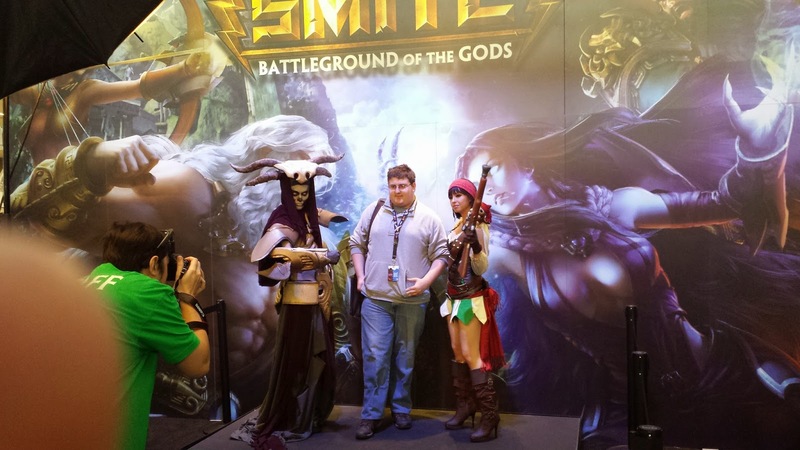 He poses for a picture with a couple cosplayers for his favorite game, SMITE (kind of a war-of-the-gods game; actually, it sounds pretty cool). Then we get out and wander. It was a couple hours before the first panel, so we took advantage of the time to explore. The displays were keyed toward gamers, channeling them into live game-play, electronic and table games both, letting them have a chance to play alpha and beta versions (as well as on-the-market products) - think of CES for gamers. The first panel he wanted to go to was, no surprise, with the creators and current developers of SMITE. It was actually an interesting panel, touching on history, current product, and future developments. Now, I have to explain a bit here: SMITE is a PC game, but they are going live onto the Xbox One platform in April, and that got a bunch of questions. Next up was a panel about designing and marketing your own tabletop game - and these games that the panelists discussed ranged from full-on board games and RPGs to a game which is played from a single business-card sized 'rulebook'. The panelists were both encouraging and realistic about the creation, developing, and marketing process, giving the audience hope and tempering expectations at the same time. We left, after the second panel. One thing that made this trip possible was the presence of my brother, just outside Boston, and his willingness to put us up for the night, saving us the hotel costs. YAY. Dinner, however, I let my son splurge a bit. Another early night, since it was Daylight Saving Weekend and it was REALLY not the weekend I needed to lose sleep! Oh well. Back to the eXpo. Not as lucky parking on Sunday - dropped him off in front so he could get in and scope things out. One of the draws of PAX is that the con gives out swag bags, as well as the vendors. The issue, though, is that EVERYONE wants the swag bags. So he bailed on waiting in line - his estimate was 5,000 people waiting. Meanwhile, back in the car - I ended up 1 1/4 miles away, in a remote shuttle lot. Parked in a puddle, caught the shuttle, then took a look at the 'monster' line. Didn't look so bad, so I jumped in. My son is texting me, wondering where I was, because the panel was getting ready to head in, and I explain that the line was MOVING. Grab a swag bag - and am sorely disappointed. Minimal stuff, or at least compared to what I was led to expect. Oh well. C'est la vie (in perfect freaking French). The panel was a reading from a play called SALVAGE, presented by the Flux Theatre Ensemble. It was an interesting reading - it's set in the near future, after some sort of apocalypse, and focuses on the activities of a team of salvage experts and revelations about their personal lives. They read the first three or four scenes, and it was FASCINATING. For more information about the play - which will be playing in NYC in April of 2015 - you can click above or HERE. Now, while I will freely admit that SF reflects the period in which it was written, , GOOD SF tends to explore different aspects of life no matter the era. That's why Foundation and The Martian Chronicles and Stranger In A Strange Land are classics despite their age and are still in print. BAD SF is not going to get read; it will fade into obscurity. As a writer - or a game designer - I don't need a panel of self-described experts telling me what not to do. One more hour-long roaming of the floor, and we were done. Why PAX? If you're a gamer, you owe it to yourself to at least take in a single day - Prime, East, South, or Australia. Just remember, if you want to do a full weekend, you have to hit it early. If you want just a couple days, or just one, then you have a few days more, but they sell out within two weeks. Link to PAX HERE (or any of the other 'PAX' references).